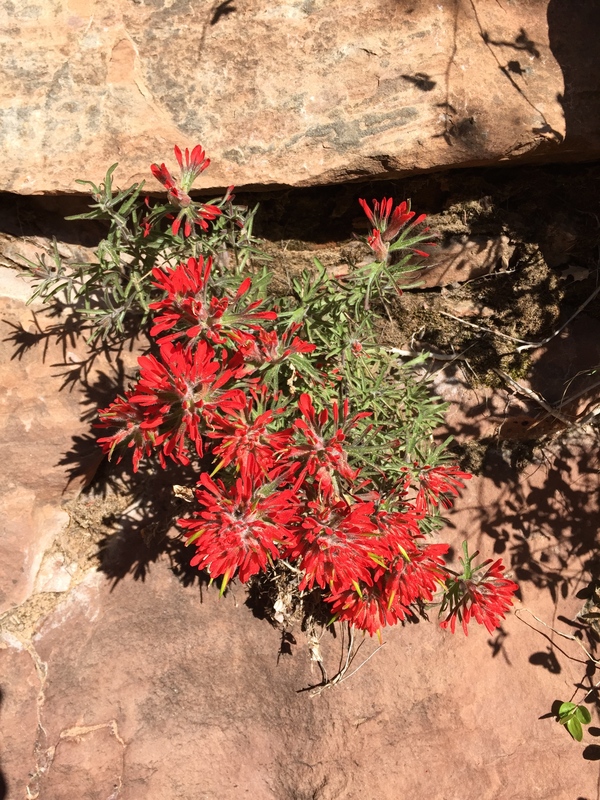 Flowers blooming out of the ledge at Zion National Park. On my most recent visit to my chiropractor we were catching up as it had been over 2 weeks since my last appointment. Dr. Josh Lander is still a new fixture in my life but I have already seen huge gains in the health of my hip and knee. During our sessions I feel free to ask any questions about the work he is doing (to help with my injuries) but we will also chat about race schedules, I ask random questions about running, and during this last visit he asked if I had been up to anything cool. I immediately felt the need to respond with an impressive laundry list of my recent feats. Work, personal life, vacation, you name it. I was so relieved that I had something “cool” to talk about – my most recent trip out west. I told Dr. Lander about the many places I visited with my cousin in just 4 days, covering over 1000 miles as we drove through Arizona, Nevada, and Utah. That’s when it hit me how much we (or at the very least I) often strive to have more on my plate: more classes, more clients, more events, more slots full. And I often find myself wanting to be able to regale folks with all the amazing things I am up to, but then have a sinking feeling that A) those things aren’t really that amazing and who’s going to give a damn? or B) Who wants to hear if I’m just living simply and feeling super happy by the little things like being able to run? I can answer that second question for you: I do! I was so relieved to hear someone, who is highly successful, happy, and motivated, be completely honest and also proud of the fact that they are living simply. And feeling fulfilled from having their health back. And when I really think about it, and dig a little deeper, I too feel full from the fact that my migraine patterns have shifted to the point where I can work, be social, regularly attend yoga, and run outside. I am so grateful that my health has taken a turn for the better. It is a very simple, yet substantial (and literally life changing) gift. It’s time to stop beating ourselves up for not doing enough, for always feeling like our plate isn’t full enough. Our plates, our hearts, our souls – they are plenty full if we stop and take inventory. Yes, I’m telling you to take it easy on yourself, create a groovy balance in your life, find your mojo, live simply. Or simply live. I love that you are enjoying living simply. I too strive to live that way and honestly, most people I meet think it’s kind of crazy that my entire day is not filled with “things and stuff “. Good for you!